I am delighted to announce my first weekend intensive of 2019. It will be in Ruislip, 13th and 14th April. Fee: £190 includes all flower materials and use of vases for the course. For more information visit my classes page or contact me. As you may know I have been taking a break from teaching, spending much more time in Japan. But I have now been able to organise another weekend intensive course of fun with Ikebana. I do hope you can join me. I am exploring possibilities for running Ikebana courses in Japan, in both English and Japanese. I will make further announcements about this over the coming months. If you’d like to spend a week studying Ikenobo Ikebana in Japan and in English, register your interest by contacting me. 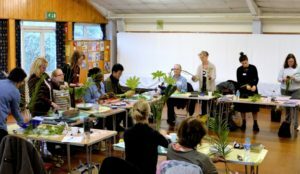 I am delighted to announce I will be running a weekend intensive Ikenobo Ikebana course this coming September. As you may know I have been taking a break from teaching during the first half of this year. I spent much of that time in Japan, where I am planning to run Ikenobo intensive courses particularly for visitors from outside Japan. I will make further announcements about this over the coming months. If you’d like to spend a week studying Ikebobo Ikebana in Japan and in English, register your interest by contacting me. 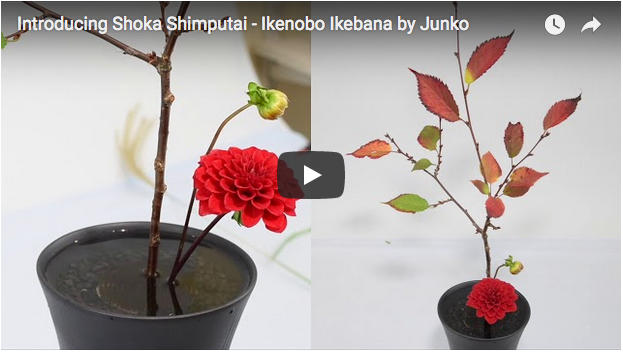 For the next few of my videos, and as a prelude to developing more indepth lessons, I’d like to give you a tour of the different Ikenobo Ikebana styles. To start with let’s take a brief look at Shoka Shimputai, one of the more modern of Ikenobo styles. 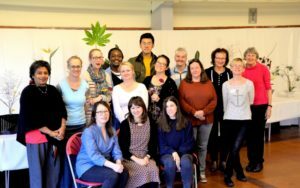 Ikebana International London Chapter no. 6 will hold its annual exhibition on 17th October in South Kensington, London. This year’s exhibition is entitled “Autimn Magic”. Ikebana International’s exhibitions are always marevellous. It is always such a great opportunity to see many different schools represented in one venue. You will see Sogetsu, Ohara, Ichiyo, Koryu and Ikenobo Ikenobo schools’ exhibits, all arranged by some of this country’s best known and most skilled Ikebana practitioners, together and I recommend anyone with a love of floral art and or Ikebana to come along. 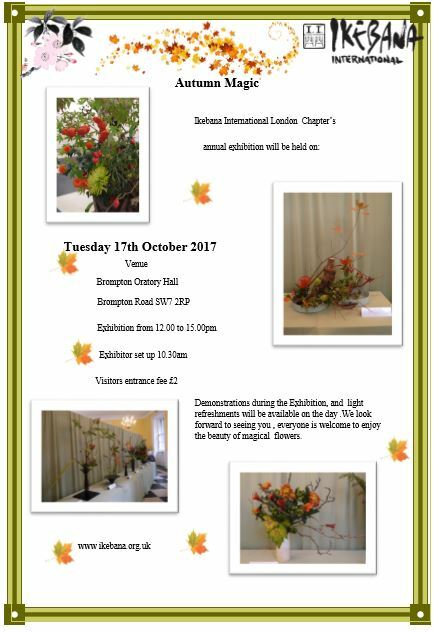 To download the flyer or for more information see Ikebana International London Chapter website. May we sincerely apologise to all our shop customers if you’ve experienced a problem preventing you from adding items to your shopping cart.This problem started on Saturday morning following an early morning update, but wasn’t spotted until today, Sunday. We have now resolved the cart problem and thank you for your patience. 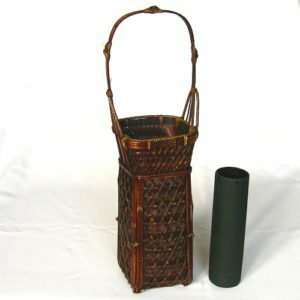 After several months of searching, Junko has now secured a small stock of these very popular artisan bamboo flower containers. We are hopeful that we can get more in the future but with the maker producing very small numbers, inevitably these will continue to be scarce. Available to order now. We have our new Ikebana vases stock ordered and on its way to us. And in a few weeks time Junko will be in Japan to seeking out new vases to add to our “autumn collection”. When we were last roaming Japan in search of Ikebana treasure, we happened upon wonderfully delicate bamboo Ikebana containers made by an artisan weaver. These proved to be so popular that we sold out very quickly and artisan doesn’t do exports, so once again, Junko will be personally securing stock…I know, it’s a tough job wandering around Japan finding lovely things to buy, but she’s very dedicated to the cause! As soon as it arrives, our new Ikebana vases stock will be posted in our shop and for our customers who have asked to be on our emailing list, advance notification will be sent a day or so before the stock is published. Would you like to join our mailing list? Just contact us and we’ll be happy to. We have now made it much simpler and more convenient for our non-UK customers to order from our online Ikebana shop. Our UK customers have enjoyed free shipping to anywhere within mainland UK for a few months now and we are delighted to say that this will continue. Non-UK orders have been a bit trickier to deal with, as there are a large umber of permutations of country and weight. 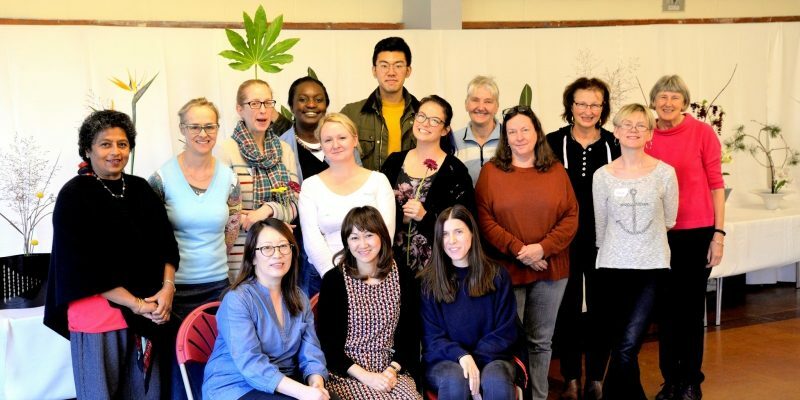 But as our overseas customer base has grown in both numbers and destinations, it became our ambition to automate world wide shipping prices to make shopping for Ikebana essentials (and indulgences!) easier for overseas customers. Now we have been able to achieve that. Our new shop will automatically calculate and apply shipping rates to your order at check out, for anywhere in the world: Just select your shipping country on our check out page and it’ll tell you how much the shipping will cost; there and then. We have tested our Ikebana shop and check out functionality extensively and believe we have ironed out any bugs. But we know that if we’ve missed anything, our customers will find it. So if you find something not working or have any suggestions of how we can improve our Ikebana shop or anything else on our website, please help us to improve by telling Keith through our contact form. We will keep trying to improve evry aspect of our site, so look out for further upgrades and updates. Do you have special requirements for express shipping, large orders for Ikebana groups or items you would like us to find for you? We’ll be happy discuss how we can help: contact Keith now.